–Tracy McCusker is at it again. This time letting us in on what to look for in a comfortable pen! Twelve years ago, I visited my doctor with blinding pain in my right wrist. It was so bad I couldn’t even flex my fingers without crippling my arm. The early diagnosis was carpal tunnel. As time went on, the pain moved around my hand–from the thumb/index finger to the heel of the hand/pinkie. Bad typing positions, inflammation problems, poor posture were all suspected. What I didn’t tell my doctor is that I had bought a skinny black & chrome Cross Century. In those days, I spent six to eight hours a day writing by hand. Note-taking, essay-writing, journaling, filling out worksheets, doodling on tests. Most of the writing was wrote and unthinking. Because I wasn’t paying attention to the writing, I couldn’t actually feel how my hand was cramping up in pain each time I picked up the pen. The Cross Century is a beautiful, classic pen. But it is the kind of pen that belongs on a desk for signing documents or jotting down a to-do list. But it sure wasn’t designed for my kind of writing. I had no idea how miserable the pen was making me until I bought another pen, the Cross ATX. The large, tapering barrel was a revelation. My hand no longer had to contort into a claw to keep a firm grip on the pen. Holding it felt so natural. My hand began to ease up—as did my wrist problems. Over the years, I’ve become adept at spotting the ins and outs of comfortable pens. With the proper pens, my repetitive stress injuries are silent more often than not. Those with arthritic or circulation/pain problems may still need more specialized instruments; however, for most, this list will help keep in mind what to look for to find a comfortable writing experience. The first indicator of a comfortable pen is its barrel size. A comfortable writing tool will fit into your hand without the need to scrunch your fingers to get a good perch on it. The Cross Century and the Cross Sport are pens that require you to tense your fingers and wrist to grip the pen. If you do any substantial amount of writing, or already have a repetitive stress injury, these pens will aggravate your wrists. The most comfortable pens will have a fairly fat barrel. Some barrels are evidently fat (Michael’s Fat Boys). Some came be hard to judge in a photograph. A good way to judge if a pen has a good barrel size is to check for a taper (a narrowing of the pen) near the tip of the pen. Tapering pens usually are fairly thick in their midsection. The taper allows you to adjust your grip forward or backward along the pen barrel depending on what feels more comfortable. If you aren’t sure what pen size is most comfortable for your hand, mid-size pens like the Parker Sonnet might be a decent place to start searching. However, the Sonnet can be a painful experience for someone with a sensitive wrist. Be sure to test it out!good way to judge if a pen has a good barrel size is to check for a taper (a narrowing of the pen) near the tip of the pen. Tapering pens usually are fairly thick in their midsection. The taper allows you to adjust your grip forward or backward along the pen barrel depending on what feels more comfortable. Closely related to the barrel size is the barrel material. A comfortable pen won’t have you fighting to hold onto a slick surface. A comfortable pen will have a non-slippery material to hold on too. As much as I love the Visconti Impressionist Collection, they are no longer pens that I can use. I own a Van Gogh Starry Night Rollerball and a Van Gogh Midi, simply to admire their fiery colors. But write with them? The Van Gogh ballpoint barrel is made from a slick resin; the rollerball (and fountain pen) have a chrome grip. Although chrome is an eye-catching material, it is one of the hardest materials to hold. Any amount of moisture (and I mean any amount!) and your fingers will go skittering off into the page. Although the Cross ATX Rollerball was the pen that sent me down the path of finding comfortable pens, I discovered its chrome grip was so slippery that my hand would constantly (and unconsciously) fight to keep a good grip on the barrel. It took longer to tire and stress my hand than the Century. However, I was still doing too much writing for it to be a long-term solution. The Cross ATX Ballpoint, on the other hand, uses the barrel material as a grip. I’ve bought several ATX ballpoints for friends and colleagues over the years, and the finishes have varied over that time. Back in 2002 and 2005, I was able to buy Basalt Black Ballpoints with fairly grippy surfaces. Recently, the popular finishes switched over to a more slippery Lacquer. For those who need a pen that doesn’t fight their grip, the ATX ballpoints in a matte finish are my usual recommended starting place. A secondary recommendation is the Waterman Carene ballpoint in a matte finish. When you look at a new pen for the first time, focus on their writing grip area. Can you see a small area near the tip that doesn’t look like the rest of the pen? Is it surrounded by a strange bump? Some pen manufacturers solve the “slippery pen material” with the pen lip. This lip is a bump, swell, or grip area near the tip of a pen. This lip helps to keep your hand from sliding onto the page. It is common to have pen lips on fountain pens, where the transition between body and nib is usually sudden; it is not as common to encounter them on rollerballs and ballpoints. However, they can still be found. Mid-range Waterman’s rollerballs usually have pen lips. The Waterman Hemisphere and the Waterman Expert have gentle flairs that keep the fingers on the writing grip. Parkers also have them: the Parker Premier and the Parker Duofold ballpoints are good examples. The Premiere has a ringed area near the tip to help the fingers find something to hang onto if they start to slip. The Duofold has an elegant swell towards the tip that attempts to prevent this slipping in the first place. If a pen uses a fairly slippery material (like a chrome or plastic resin), but has a pen lip, chances are it will be easier and more comfortable to use these pens than ones that lack the lip. For those of us who have the worst wrist troubles, the most comfortable writing experience is with pens that have specialized grips. These specialized grips are often made of different materials from the rest of the pen; sometimes these specialized grips sacrifice sleekness for comfort. The four major types of grips are knurled grips, cushioned grips, geometric grips, and grooved grips. Knurled grips are those that have miniature criss-cross or diamond shapes cut into the metal. Examples of knurling are xacto-knife grips or grips on drafting pencils. While metal doesn’t sound like it would be comfortable on the skin, it is surprisingly effective for tools that must be held tightly or for long periods of time. Knurled grips on fine writing instruments are rare (a few discontinued Rotrings were knurled), but you can find types of knurling on pens like the Caran d’Ache pencils. Cushioned grips are only slightly easier to find on luxury pens. At least two higher-end pen makers have built a reputation around cushioned grips: Michael’s Fat Boy and Sensa. The occasional pen from one of the big names has a cushioned grip: the Cross C-Series Rollerball and Fountain Pen both have a rubberized, cushioned grip. It’s no surprise that the C-Series is one of my favorite new designs from Cross. Geometric and grooved grips are pens that depart from the shape of the pen body in order to fit more effortlessly into the hand. These can be hexagonal grips, triangle grips, a gently contoured set of waves. These kinds of grips are definitely not the norm for luxury pens—many of my favorite geometric grip pens were phased out years ago like the Cross Morph which actually changed shape from a smooth barrel to a triangular-shaped surface when you “dialed” out the tip.Keep in mind that all people write with different grips. While these four general principles hold true for comfortable pens, you might find a particular pen comfortable that I consider to be impossible to hold. Above all, if you have a repetitive stress injury, it is important to listen to what your body is telling you and seek out your instruments accordingly. Keep in mind that all people write with different grips. While these four general principles hold true for comfortable pens, you might find a particular pen comfortable that I consider being impossible to hold. Above all, if you have a repetitive stress injury, it is important to listen to what your body is telling you and seek out your instruments accordingly. Check out the Executive Essentials Catalog for many exciting pens with different grips that will suit your style of writing. Last year’s gift guide was so massive that it was split into three posts. If you’d like to read last year recommendations, visit part one for pens up to 50 dollars, part two for pens up to 100 dollars, part three for pens 200 dollars and over plus some recommendations for pens for first-time fountain pen users and pens to impress. The holiday shopping season is almost upon us. To the avid pen shopper, that usually means pen closeouts on the big-name pen brands. Waterford, Cross, and Monteverde all have mouth-wateringly low prices in anticipation of Thanksgiving (I could use another C-Series). The holiday season also means gift guides for the amazing array of pen choices. The year had a spate of interesting firsts. November 2nd, 2012 was the very first international fountain pen day. The year has also seen updates to Parker’s line, with 5th technology (an entirely new way of writing, halfway between a fountain pen and a rollerball) entering into the ranks of the Sonnet and the Urban. Monteverde introduced several new additions to its line, in the form of two new stylus pens. Montblanc introduced its sublime Limited Edition Jonathan Swift for its Writer’s Edition. This year’s gift list has a more equal representation of ballpoints and rollerballs than last year, which was heavily skewed towards fountain pens. I have included a pen’s availability in different modes after each entry. Many of the collections on this list have a selection of all three modes, so do browse through an entire line if you like the look of a pen. Below are my picks for 2012. Stocking stuffer pens are pens that are incredibly low cost, but still are interesting enough and well-crafted enough to warrant their inclusion on this list. Though there is a wide range of pens below 10 dollars, only two made the list. Monteverde is known for bold colors and reinvented classics. The Poquito Touch is a reinvention on the slim-form pen, epitomized by the Cross Century Classic. The compact Poquito Touch reaches out to technology enthusiasts. The pen is a twist-action ballpoint and a stylus for any touch screen: tablets, phones, e-readers, GPS screens, and public ATMs. The Poquito Touch feels nimble in the hand and will fit nearly anywhere (Monteverde’s other stylus, the One-Touch Engage, has more heft and feels more awkward when using it with phones). The matte finish on the Poquito looks more convincing and restrained than the other newly introduced slim-line pen, the Cross Click. Best of all, the Poquito Touch is bargain-priced. Its bigger sibling, the Poquito XL, is longer but keeps its same slim profile. The XL is more comfortable for touch-screens that aren’t phones, or for folks with larger hands. Both pens are excellent ballpoint/styluses, and an absolute steal for the price. Available as a ballpoint with a stylus. The Tombow Airpress isn’t a traditional office pen. It’s a pen meant to perform under pressure; clicking the top of the pen injects pressurized air into the pen and allows it to write upside down. This is the first stylish pen since the Fisher Space Pen to claim such an unusual and rugged application. The Airpress’ design revels in its high-tech look. The barrel is plastic with a rubberized grip. The Airpress is billed as a pen for outdoorsy people who need to write under less-than-ideal conditions (On wet paper! In dusty rooms! ), but the Airpress is for anyone who has to use a pen in working conditions. For me, that means in the studio with wet papers or paper coated with unfortunate spots of terpenoid and paint. For others, that might mean in the lab, at a workbench, or in a shop. With its grip, you can actually get a good hold on the barrel. This gives the Tombow Airpress a definite advantage over the all-chrome surface of the Fisher Space Pen. For less than ten dollars, it makes for an amazing and memorable gift. In the world of luxury pens, a pen under $35 is considered cheap. The pens I selected for this list certainly have low prices, but they are all from respected brands with solid craftsmanship. These pens skew towards ballpoints and rollerballs, but there are at least two stand-out fountain pens in this price bracket. The Tombow Zoom 707 may be the slimmest pen on the market. It looks like a refill with a grip attached to it. But it is one of Tombow’s most innovative pen designs. It’s incredibly thin profile make it well-suited to pens for occasional writing (like with a planner), pens for readers who want to mark their place in a book without bending the book’s spine, or writers who find thin pens to be more comfortable than thick ones. Like the Airpress, the Zoom 707 may be one of the more unique pens I’ve come across in recent years. The Zoom 727 is a refinement of the 707’s design. It is (slightly) wider click pen that looks more like a thin office pen with a cut-away top. Though the 727 may turn fewer heads than the 707, it is more comfortable for long-hand writing. I’ve written about the Caran d’Ache Classic before. It was one of the most pleasant surprises of 2012 when I purchased one as my summer pen. The pen is styled with a hexagonal barrel like old No. 2 pencils. It is a click-pen with a fairly quiet mechanism. The barrel of the pen is enameled metal. The metal construction makes the lightweight Classic feel more substantial than plastic pens of the same size—but not as heavy as lacquered brass-barreled pens like the Monteverde One-Touch. The pen has been a dependable writer and an excellent sketching pen for client work. Though the Classic does not have a dedicated grip, its hexagonal barrel makes it easy to hold for long periods of work. I’ve received several compliments on mine when colleagues have mistaken it for a pencil and were surprised to find a metal pen instead. If the minimal design is appealing, I highly recommend the Classic; Caran d’Ache pens are second to none, and the Classic carries on that tradition. Available as a ballpoint or mechanical pencil. The Pelikano is the “adult” version of the Pelikano JR. Like the now-discontinued Rotring Core, the consensus seems to be that the Pelikano is woefully lacking in the style department. To be fair, its bright colors may seem garish to lovers of more subdued or traditionally styled pens. As someone who finds most fountain pens to be too subdued, I find the Pelikano’s bright colors, rubberized grip section and metal cap to be just interesting enough. More importantly, for the price, the Pelikano has a smooth nib. Pelikan has exceptionally supple steel nibs that turn in performances on-par with their 14k gold nibs. The Pelikano is no exception. It is also available as a left-handed or right-handed fountain pen. If you are left-handed and have not tried fountain pens (or tried and were disappointed with them), the Pelikano may be just the pen to convince you how excellently they can write. When buying the Pelikano, just ask yourself a few questions. Does your recipient like bright colors? Are they a new fountain pen user looking to branch out? Have they ever wanted to try a Pelikan, but didn’t want to purchase a spendy pen? A Pelikano is a great starting point for exploring a venerable pen brand, and it’s a fairly inexpensive way to do it. Even the users who find the pen ugly usually find the nib and the writing experience of the Pelikano to be above reproach. Available as a left-handed or right-handed fountain pen. 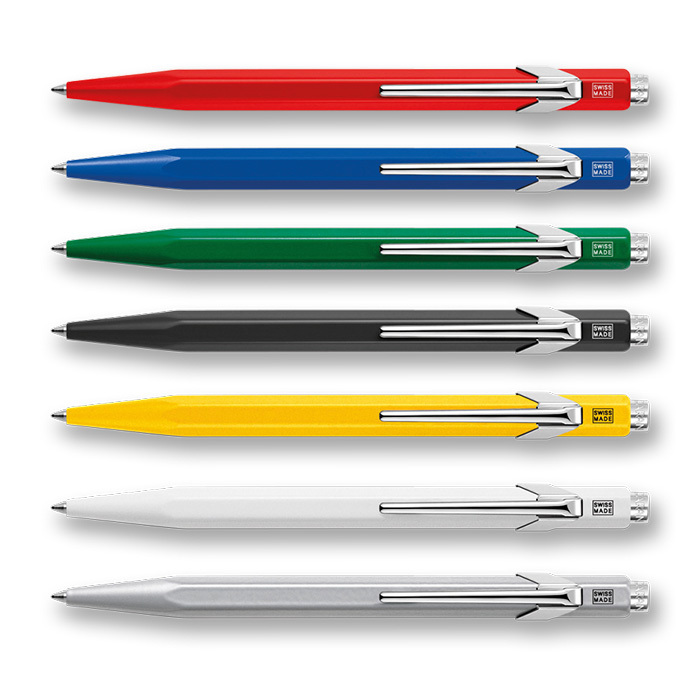 The Safari is one of the flagship collections for Lamy. It has a full range of pen types: pencils, ballpoints, rollerballs, fountain pens. It has a demonstrator line (the Safari Vista), and special edition color (Lime Green). The brightly colored pens are considered staples for students because they are lightweight, stand up to a good deal of abuse, and the fountain pens write under most normal conditions without skipping. The bodies are hard plastic and can be tossed into a backpack pocket, or into a purse without worrying about scratching it up. Safari nibs turn in a good performance if you have an ink with a good flow, or a light touch when writing. The steel nib is good (though stiff), especially considering the price. The form factor for the fountain pen and the rollerball are well-balanced; a Safari feels balanced whether the cap is posted or not (posting a cap means to attach it to the end of the pen while you write). The Safari ballpoint is a capless click-pen. Its grip, smooth barrel, and simple colors made an impression on me. The click mechanism was an attractive black appointment; the accordion shape is distinctive. Depending on what kind of pen your giftee likes, I would recommend the fountain pen as highly as the ballpoint. Available as a pencil, ballpoint, rollerball or fountain pen. Common wisdom says that you need to spend at least a hundred dollars to buy a good fountain pen. For half that price, the Namiki Prera is a more than suitable writer. The Prera has a finely-finished plastic body that is faintly translucent under bright lights. It is a very small for a fountain pen; with its cap closed, the Prera is the same size as the Caran d’Ache Classic. Posting the Prera’s cap while writing makes up for its diminutive size. The Prera is a demonstrator—which is likely to catch anyone’s eye. Namiki is a Japanese company; Japanese nibs are smaller than most European companies. A fine nib on a Namiki writes more like an extra-fine or extra-extra fine in Waterman or Lamy nib sizes. If your gift recipient favors a particular nib size, buy up one size (you likely can’t go wrong with a medium nib). The Prera is a smooth, wet writer with the right ink. 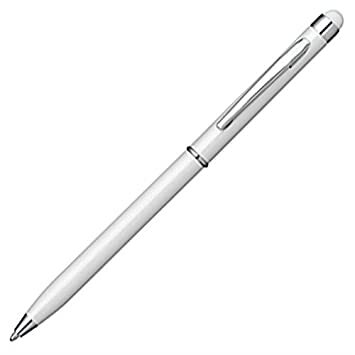 It is also a beautiful, minimalist pen that impresses once it’s in your hand. Available as a fountain pen. The Cross ATX returns to the gift list for the second year, and it’s no wonder why. The Cross ATX is a modern design classic, like the Lamy Studio. The ATX is a lacquer and chrome pen that tapers at the ends to create a sloping profile reminiscent of the Waterman Carene. The ATX’s chrome appointments don’t overwhelm the pen’s final weight. The pen cap posts beautifully on the rollerball and the fountain pen. The grip section is comfortable during note-taking. The fountain pen nib may start out with a bit of feedback, but it becomes smooth with weeks of writing. Cross fine nibs tend to be on the scratchier side, so I recommend mediums for those looking for a smooth writing experience. Cross pens are quality instruments. My oldest ATX is 11 years old; my newest is 2 years old. I’ve shoved them into bags with loose change, jammed between desks, and run over by my office chair with no chipping of its lacquer (instead, they’ve gained a very subtle set of hatching marks where I’ve treated them badly). As an added bonus, Cross pens are discounted by 20% this month, with the chrome version of the ATX in Clearance. I highly recommend the ATX to anyone who enjoys writing and especially to those who use their pen on-the-go. I’ve recently sung the praises of Monteverde pens, and the Invincia in particular. The Invincia is a bold, flashy pen. Its surface is a highly polished resin over brass, with black appointments. The Stealth is an entirely all-black pen, right now to the black coating on the fountain pen nib. It is at the opposite end of the thickness scale from the Monteverde Poquito. It is a heavy pen, with a thick grip section. On the fountain pen, it has a gigantic nib that fairly screams “fountain pen” to anyone else in the room. The Invincia is the kind of pen you buy to notice. 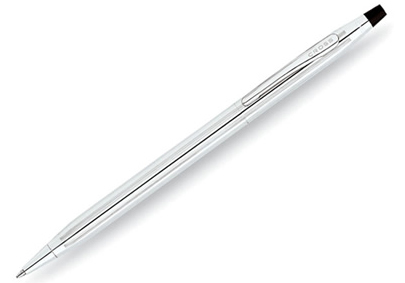 Its heaviness is comparable to the Cross C-Series ballpoint–another thick, flashy pen. Like other pens that ooze style, be sure that the recipient likes the Invincia’s flashiness, as it’s a certainly not a middle-of-the-road design. It should be noted that the Invincia’s barrel is designed so that the cap often does not post well. Because the pen is already so heavy, it is likely you will not want to add the extra weight to the barrel as you write. Available as a ballpoint, rollerball, inkball or fountain pen. Next Week, part two will cover mid-range and luxury pens, plus gift ideas for pen and desk accessories.